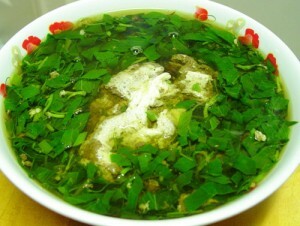 Crab soup – To make” canh cua”, we need patience, skills , tactfulness and experience. We need to prepare ingredients including: red chilli, green onion, “ quả dọc” , “ nước mắm”, oil, tomato, salt and pepper. Crabs are washed carefully, removed hard shell (carapace) and “ yếm” , then kept dry. “Gạch” or crag eggs are kept separately. Crabs are ground with some salt, pressed with cool water and filtered carefully to gain liquid. “Quả dọc” is grilled and cut into small slices. If you cannot find this acetic fruit, you can replace with rice vinegar. Tomatoes are washed and finely chopped into small pieces. We mash onion and chilli together using a mortar and pestle and then heat oil, stir fry mashed spring onion and chilli, we add “gạch cua” and stir until fragrant. Afterwards, we add some spices into the liquid of crabs and boil it for 15 minutes. Then we add tomatoes into the pot. Bring the liquid to a boil and add fried ”gạch cua” and cook for several minutes. While cooking we keep the low level of fire and avoid stirring, which will break the crab mixture into pieces and reduces the flavour. When the pot boils again, we add green onion and salt to taste “ Canh cua” is usually served with pickled eggplant that creates a delicious taste. We can use it with streamed rice or bún.